Recommended Name: � no recommended name. This pattern was originally classified as S-2. The name at present given to this pattern is an arbitrary one for it is not yet clear why it was made on both sides of the border between France and Spain. This must be one of the earliest patterns ever to have become established although unfortunately it did not survive the 17th century. Needless to say, therefore, examples are few and far between but are intriguing for the questions they raise. The two earliest examples are believed by the Musée Dupuy in Toulouse to have been made in that city. Both are in the form of single sheets bearing court cards, aces and Sword pip cards only. The first, early 16th century, is pulled from a woodblock from which, sadly, the maker's name has been almost completely erased, leaving a useless "MG" right at the end of the ribbon provided on all the Jacks. The 4 of Coins, which elsewhere bears the maker's initials, is absent. The next example, later 16th century, is in the form of a sheet which was found as a binding of a manuscript compiled in Toulouse and finished in 1567. Also from the 16th century is an anonymous part pack, now in the Museo de Naipes, Vitoria, which was found in the town of Bañoles in the province of Gerona. The final pack, probably 17th-century, is complete, made by Louis Millieu of unknown whereabouts, and one of the coins on the 2 of that suit bears the Spanish Catalan badge. The court figures in this pattern are mostly quite distinctive particularly in the Baton suit in which all three figures hold the weapon pointing downwards. The Jack shares this feature with one in another very early Franco-Spanish pattern (yet to be positively identified) together with the corded ace of Coins and 4 of Cups. 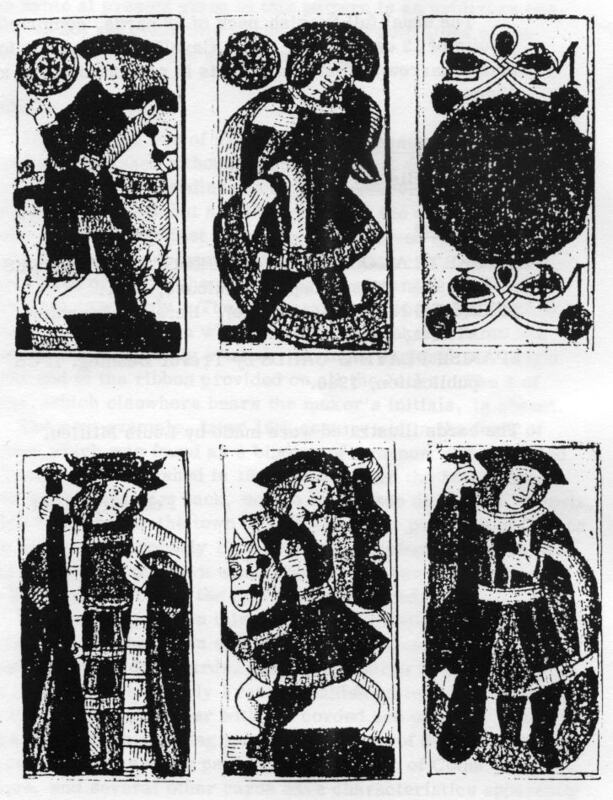 The down-pointing sword of the Jack of Swords is also shared with some other patterns but the Jack of Coins seems unique, and several other cards have characteristics apparently their own. 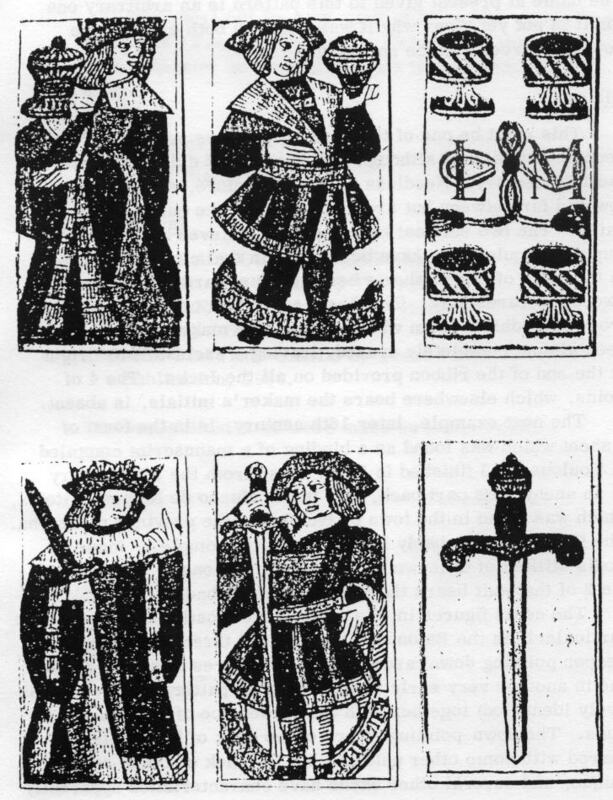 The usual full Spanish pack of 48 cards, comprising 4 suits of 12 cards, 1-9, Jack, Cavalier, King. The format is narrow and measurements in proportion of 87 x 47mm. LA CARTE A JOUER EN LANGUEDOC DES ORIGINES A 1800. Musée Dupuy, Toulouse, 1971. MUSEO DE NAIPES (catalogue). Heraclio Fournier, Vitoria, 1972. SPANISH PLAYING-CARDS by Trevor Denning. IPCS publication, 1980. Cards made by Louis Millieu.